4.75" Long Lug MFI HK G28 DMR Style Muzzle Brake / Flash Enhancer for any weapon with 5/8 X 24 threaded barrel. For 300 Black Out Only (NOT .308). 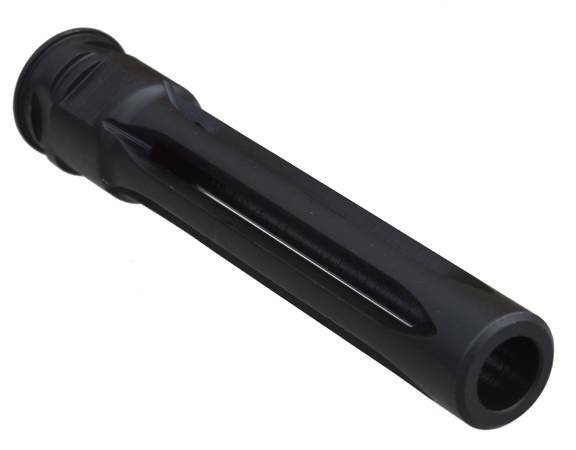 Designed specifically to fit 12.5" AR15 Style Uppers in 300 Black Out. MFI HK Style G28 Muzzle Brake / Barrel Extension 4.75" Long FOR 300 Black Out ONLY (NOT .308). Thread is 5/8 X 24 tpi Right Hand. This Version of the MFI HK G28 Flash Suppressor Muzzle Brake is specifically made for any number of builds that require a minimum barrel length of 16". This one is threaded WITH a Counter Bore I.D. @ 5/8 and depth @ 0.200". Your OAL barrel length should end up being about 16.35". 922r Compliant: This item qualifies as a 922r compliant part if it is permanently attached to your barrel to make a 16" long BATF legal barrel. Thus counts as (1) USA MADE PART. Unlike our other products this item is specifically for a VERY LIMITED MARKET and as such is made in very small volumes. Normal production for any other item is 1000 per year minimum. So it goes without saying we have to charge more money for these. We do our best to keep the price down for our valued customers. Support the USA and "Buy American". Threaded WITHOUT any Counter Bore. Maximum Length: = 120.75mm or 4.750 inches. Maximum Barrel Extension: = 107.75mm or 4.250 inches. Mil. Spec. Black Oxide to give the unit a semi matt finish. NOTE: Even though the overall length of this item is 4.75" part of that is the threads. As you can only count the threaded area once (threads in the adapter cover the threads on the barrel) the total ADDED LENGTH to any weapons system's barrel would be about 4.25". Muzzle Brakes are also known as: Flash Suppressor, Flash Hider, Flash Hinder & Anti Climb Device. These are designed for LIVE FIRING. We test all our Muzzle Brakes / Flash Suppressors to be 100% sure that they function shot after shot without any problems. MFI uses the term "Flash Suppressor" ONLY in reference to the shape / look that our Muzzle Brakes have as they are designed to mimic the external appearance of their Military Counterparts. The fact is that all our Muzzle Brakes have ZERO Flash Suppression and little if any Anti-Climb effects during shooting. This is because we bore out the forward section with a straight through hole to allow the customer to adjust / fine tone the exact Overall Length of the weapon to achieve the best looking and 100% legal result. That being said our product does NOT suppress any flash and in fact through our testing and above photograph clearly demonstrates "FLASH ENHANCEMENT" and NOT "Flash Suppression". So, while this item is NOT a Flash Suppressor it is also NOT a Muzzle Brake as it lacks the two main features of any muzzle brake i.e. anti-rise and anti-recoil characteristics. For these reasons if you are looking at doing a "Featureless Rifle" using a G28 Flash Enhancer it may or may not be in compliance, as it all depends on how your interrupter the new law. It should be in compliance as it does not suppress, but rather enhances the muzzle flash, whether or not it can be seen as diverting any of this flash away from the field of view is a matter of opinion as that has not been spelled out in the law as a solid definition yet. The field of view is anything in front of the shooter and it would be hard to claim that with a fire ball this size that any shooter could not see it in all respects. Ultimately this is a question for a CA. DOJ Registered FFL who is doing the conversion. Always go with what they recommend.